Join 50,000 of your peers by getting the latest content marketing updates delivered directly to your inbox weekly. That’s our three-word assessment of paid content syndication in 2019. The search-engine optimization benefits are non-existent, the tactic is incredibly click-baity and it doesn’t work well for a modern audience. Your money would be better spent on new mousepads for everyone in your office. Content syndication (unpaid) is when you republish content that appeared on your company’s blog or website elsewhere on the web. The syndicated content could be a full article or a snippet that links back to the original source. This is different from guest blogging, which involves creating an exclusive piece of content for a third-party outlet; the guest article does not appear on your site. That said, some publishers have content syndication networks they might use to promote guest content. The benefits of content syndication include reaching a larger audience through off-site distribution networks, earning links back to your original post to help build page authority, gaining brand recognition, improving traffic to your site and also expanding your social media presence. A common path to free content syndication is to pitch articles to websites such as Business Insider, Huffington Post, Forbes, Lifehacker and other online sources that welcome contributed content. Often, the repurposed post will have a disclaimer stating, “This content originally appeared on [insert blog here],” that links back to the original article, video or graphic. BuzzFeed Community (must use as an individual and not as brand). RSS (Really Simple Syndication) is another example of content syndication whereby users can receive updates from blogs. It was useful in the early days of the web – and it remains the distribution mechanism for podcasts – but social media and free aggregators have made it fairly easy for users to curate their content without RSS feeds or readers. Each of the headlines and blurbs in the photo above links to a different content source. The fact that content syndication can refer to two very different things is a common source of confusion in the industry. While both methods are valid, republishing content on a website or blog that’s well-respected in the industry gives you the chance to tap into that source’s existing audience. Case in point: More people reading this have probably heard of HuffPost than ZergNet. What is paid content syndication? Paid content syndication is content syndication that you pay for. One example might be paying an online industry magazine to publish an article on the site as a means of building thought leadership and brand awareness. This is perhaps the only form of content syndication that’s maybe worth the investment. This is an example of paid content syndication via Outbrain. The cost-per-click service uses algorithms to determine which content channels (CNN in the example above) to advertise your blog content on. Placement is typically based on inputs from the customer, such as ideal syndication partners. A headline and image that links back to the original content is then posted on channels that align with those expectations. Relative to CPC for paid search, the expense is fairly low, with rates at around $0.25 to $0.50 per click in many cases. Each time a user clicks on paid content, the customer is charged, and the user is navigated to the original source of the blog post or video. Paid content syndication only works if you’re already creating original and useful content. Otherwise, you have nothing to distribute or promote. Content creators attempting to get a new blog or resource center off the ground can use paid content syndication to earn early traffic through third-party sites that already see a lot of it. Many other marketers might use content syndication to hit a monthly or quarterly traffic quota. And that’s about it as far as benefits go. Beyond potentially aiding in content discovery, there are few if any advantages of paid content syndication. Developers created this attribute to prevent advertisements from having an outsized influence on search rankings. Paid content syndication is a form of native advertising, one that, because of the nofollow tag, does not affect page search rankings. In other words, paid content syndication networks like Outbrain and Taboola don’t give you any of that sweet, sweet link juice that will help you build page authority. For the uninitiated, high-quality backlinks are critical in SEO. Google sees a link from any source that has high domain authority as an indicator of that content’s usefulness, credibility and trustworthiness. All of that goes out the window with paid referrals thanks to the nofollow tag. So while on paper it looks like CNN is linking to your content, Google doesn’t see it that way. Paid content syndication networks offer literally zero concrete SEO benefits. Again, the one potential upside of paid content syndication is that it can generate traffic. More eyes on your content can theoretically mean more lead generation, especially if you’re using email-capture resources. But paid traffic for the sake of traffic means very little if you’re not landing qualified leads, which is often the case since many syndication networks automatically generate headlines that don’t precisely match the content. Content syndication services will nevertheless go to great lengths to convince you that your articles are getting in front of the right people. A (weak) case can also be made that a user who sees a paid article from a website or blog may be more likely to click on organic links to your site in the future. However, this type of influence is incredibly difficult to measure using KPIs. Long story short, paid syndication makes a negligible contribution to inbound marketing and a non-existent one to SEO. The average click-through-rate of a modern display ad is less than 0.1 percent, partly because of ad blockers, partly because users just don’t trust them. But the bigger culprit is banner blindness, which refers to a type of selective attention on the web. Simply put, people have learned to ignore ads and ad-like things. Eye-tracking research conducted by the Nielsen Norman Group found that many web users will instinctively overlook banners that resemble ads, like when it appears in the margins or bottom of the page. Incidentally, that’s where the bulk of paid content syndication links are displayed on desktop. The click-through rate for native advertising (including paid content syndication) is admittedly higher than display advertising, but still less than half a percent. Why so low? Because paid content placement is easy to spot, and even easier to ignore, so much so that you probably don’t give those spammy articles a second thought. If anything, you run away from them. Maybe this point is better phrased as a question: How often do you click on paid content featured on CNN.com? Barring accidentally opening in-line paid articles while scrolling through a mobile news feed, probably never. 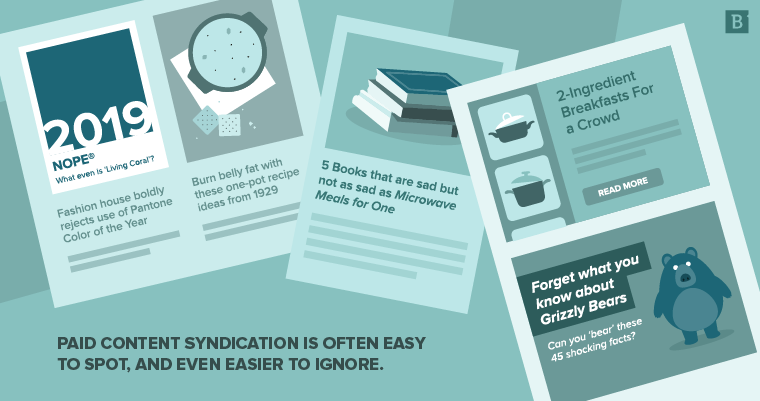 Is paid content syndication ever OK? Other than maybe paying for a sponsored article in say, Forbes? Only on social media, and only if we reeaally stretch the definition of paid content syndication. A sponsored post on Facebook or a promoted tweet on Twitter intended to call attention to your blog content serves a similar function to paid content syndication: to use an external or offsite platform to generate traffic to a piece of content. The difference with social media is that you’re targeting an existing network of people who are ostensibly engaged with your brand for a reason. The purpose of a sponsored post on Facebook, for example, is to “boost” that post so it appears more prominently in your followers’ or fans’ newsfeeds. In this sense, you inherently have more control over who sees the post than you would with paid content syndication. So does regular old content syndication help SEO? It certainly has more potential than paid content syndication to provide real SEO value since it’s a form of organic content distribution. Republished blog posts and videos, for example, typically link back to the original article. When that link comes from a site with strong domain authority, you get some link juice. Referrals from that backlink (users clicking to see the original source of article) gives you even more link juice. Your brand is also credited for the content, which helps make it more top of mind for readers. As an added bonus, many content syndication sites have large social followings since that’s how they distribute and promote content. Consequently, you may see a potential boost in impressions and in overall social engagement. Duplicate content is generally bad news for SEO, so the idea of republishing your original content on another blog or website may seem counter-intuitive. Let’s go back to the tags. When syndicating content, make sure that the publisher featuring your article, video or graphic uses the rel=canonical tag. This tells Google which version is the original source of the content. You get the aforementioned link juice that the syndicated content will help to attract. The syndicated posts don’t start to outrank or outperform the original content. The other option to prevent your content syndication from backfiring is to use the meta “NoIndex” tag for the syndicated versions of posts. This informs Google not to index the content, meaning it won’t show up in search results. Always try to go with rel=canonical tag over the NoIndex tag. You may run into situations where the publisher refuses to use either. In those cases, transparent attribution and a backlink to original content is your last resort. It needs to be relevant to the publisher’s audience and align nicely with reader intent. The actual content needs to be well-researched and well-written. The copy needs to be accurate and clean. Remember, content syndication with a third party is a two-way street. The third-party publisher is giving your content free exposure to their readers. Therefore, it needs to provide insights, instructive advice, thought leadership or some value to the audience that wasn’t already there. We’ve made our feelings about paid content syndication abundantly clear. And while organic content syndication is demonstrably superior, it still represents a fraction of any content marketing strategy. Granted, a little over a fourth is nothing to scoff at; however, the “ideal content marketing mix” is typically made up of 65 percent content creation, and 25 percent content curation (e.g., sharing relevant articles through a social media platform or curating user-generated content). That leaves about about 10 percent for content syndication. And again, there’s nothing wrong with that. Content syndication can be a powerful distribution and promotion resource, and one that’s good for SEO to boot. But it should never be the focus of a content marketing strategy. More importantly, it should almost never be paid. Content marketing has come a long way since the days of keyword stuffing. Paid content syndication is, if anything, a step backward and away from well-rounded content strategy. In the majority of cases, it does little to meaningfully contribute to inbound marketing, and even less to improve SEO. This is all to say, be careful about how much you spend on paid content syndication in 2019. Dominick Sorrentino is a senior writer in Chicago. He's a wordsmith who endeavors to use language, story-telling and creativity to solve problems. He enjoys pizza, the musical styling of A Tribe Called Quest, traveling, a good conversation and, of course, putting pen to paper.